Sophomores living the in the Delta Tau Delta house are being relocated to residence halls as the university finalizes its investigation into an incident on which it has provided few details. OXFORD, Ohio — Miami University has suspended a fraternity after officials said they received a "serious and credible report of dangerous hazing." Sophomores living the in the Delta Tau Delta house are being relocated to residence halls as the university finalizes its investigation, Miami President Gregory Crawford wrote in a letter announcing the suspension to the college community. "The contents of this report are brutal and deplorable, and have brought us to a tipping point on this campus," Crawford wrote, adding that he was "disheartened and outraged" by the behavior outlined in the complaint. The Fishers, Indiana-based fraternity wrote in a news release that it has suspended the chapter following the report. "Hazing has no place within Delta Tau Delta," fraternity CEO Jack Kreman said in the news release. "Despite intentional effort to educate members through national resources and local volunteer guidance, chapter members chose to treat new members inappropriately. The fraternity has no tolerance for such behavior and those involved will be held accountable." 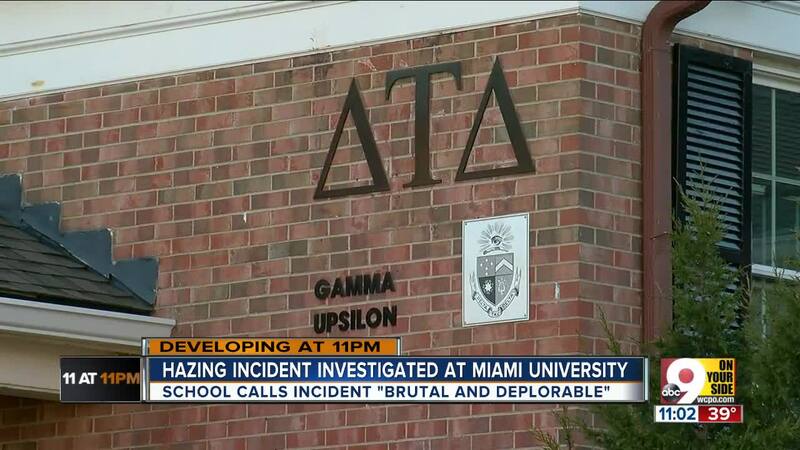 Oxford police told WCPO that they are also opening an investigation after opening an investigation after receiving a report of hazing at the address of Delta Tau Delta's Miami chapter house.